It is the best hostel in SF. I had a great time there! The staff was amazing! Going out of their way for their guests like free tours, free storage of luggage before and after check in, etc. I would gladly stay there again! The hostel has small dorms, plenty of clean showers, great spaces for socialization and the most friendly hostel staff I have ever encountered. 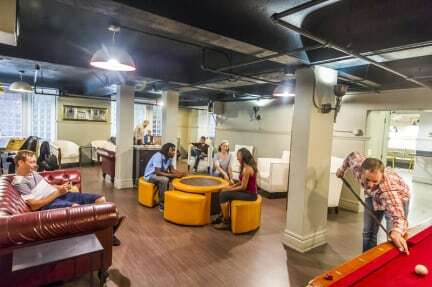 The workers at USA Hostels SF go out of their way to socialize with guests. I've never felt more welcome anywhere! My experience here was so great I've decided to return next month. Good hostel overall. But do not do the hostel free walking tour. I'm saying this as constructive feedback but the guy who took us didn't know anything or even attempt to give information. Waste of time, better to just look up other walking tours on google. But otherwise it was good! Remember to bring a thick lock for the lockers as small ones don't work. I am a young professional that was in town for a conference, so I am not your typical hostel guest. But the hostel worked well for my needs. The four women enclosed bathroom provided privacy and comfort at a very accessible price. The breakfast is above your average hostel offer (you can make your own pancakes). The staff was great. They put up signs in one of the common areas to minimize noise during a job interview and I was able to shower at the hostel hours after my check-out. Great location and very friendly staff. The corridor smelt super funky but other than that very good. Breakfast in the morning was generous and beds all have privacy and charging points / lights. Having stayed in a lot of hostels, this was definitely one of the better ones! I’ve never stayed in a hostel with such great shower and toilet facilities - you don’t have to poop with other people in cubicles next to you, which is great! And the showers were equally private. The only negative about this hostel was that it’s quite close to the Tenderloin and I found myself walking right through the heart of it on my first day - not a pleasant experience as a solo female traveller! Hostel was okay. It is clean enough for what you expect from a hostel and rooms are decent. Staff were okay, but not always forthcoming with information. There is a bike tour at the hostel however you are probably better off to do it independently, as the tour guide offered nothing and cycled way ahead, leaving the group lagging behind. Free breakfast and the lounge areas are good, however there is no bar. The atmosphere is flat and it is not good for meeting people.